The fringes of Hurricane Wilma lashed Caribbean nations on Wednesday, forcing schools to close and thousands to evacuate as it churned toward Mexico's Cancun resort and Florida after killing at least 12 people and becoming the most intense storm ever to form in the Atlantic. The National Hurricane Center says Wilma weakened to a Category 4 hurricane with maximum winds near 155 mph. Still, the center in Miami warned that Wilma would be a "significant threat" to Florida by the weekend in a season that has already seen devastation from Hurricanes Katrina and Rita. Officials ordered tourists out of the Florida Keys. , as new computer models are giving diverging scenarios, including the possibility that the hurricane will miss Florida altogether. "Confidence in the forecast has gone down significantly," Norcross said. CBS News correspondent Jim Acosta reports that a usually mild-mannered Max Mayfield, the director of the National Hurricane Center, ramped up the tension. "We had well over 1,000 lives lost in Katrina. If Wilma, you know, comes into the U.S., to the Florida coast as a Category 3 or 4 hurricane, that potential for large loss of life is with us," he said. The White House, stung by criticism that it had not responded quickly enough to Katrina, promised to stay on top of the situation. 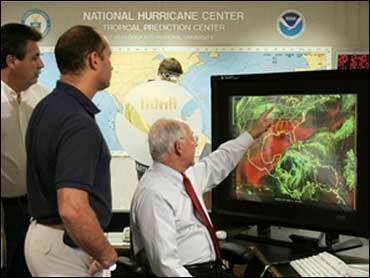 "We are closely monitoring what is an extremely dangerous storm," said White House spokesman Scott McClellan. "People should take this hurricane very seriously." Tourists packed Cancun's airport in hopes of catching flights out and MTV postponed its Video Music Awards Latin America ceremony, originally scheduled for Thursday at a seaside park south of the resort town. Floridians braced for the storm by boarding up windows and stocking up on supplies, although forecasters at the hurricane center said the forward motion of the storm appeared to be slowing, which could cause it to eventually weaken. Mayfield said Wilma may not reach the Florida Keys until Saturday, possibly toward the evening. It had earlier been expected to reach the Florida mainland Saturday. "We're gonna batten down the hatches, take our boat, and run to Northern Florida," Wally Graskoski, a resident of Punta Gorda, Fla., told Acosta. Heavy rain from Wilma's outer bands also forced evacuations in Honduras, Cuba, Jamaica and Haiti — even as much of Central America and southern Mexico was still recovering from Hurricane Stan, which left more than 1,500 people dead or missing. Wilma was on a curving course that would carry it through the narrow channel between Cuba and Mexico on Friday, possibly within a few miles of Cancun and Cozumel. At 11 p.m. EDT, the massive storm was centered 235 miles southeast of Mexico's Cozumel Island, and was moving west-northwest at 8 mph. Wilma's confirmed pressure readings early Wednesday dropped to 882 millibars, the lowest minimum pressure ever measured in a hurricane in the Americas, but it later lost power and rose to 900 millibars, according to the hurricane center. Lower pressure translates into higher wind speed. The strongest Atlantic storm on record, based on pressure readings, had been Hurricane Gilbert in 1988, which registered 888 millibars. With heavy rain, high winds, and rough seas already pounding coastal areas, flood-prone Honduras warned that Wilma posed "an imminent threat to life and property." The country closed two Caribbean ports. The closest land to Wilma's eye were the nearly uninhabited Swan Islands, once used by the CIA for propaganda broadcasts to Cuba. They were 35 miles west of the storm's center. The head of Haiti's civil protection agency, Maria Alta Jean-Baptiste, said rains associated with Wilma caused floods and landslides that killed at least 11 people since Monday. At least 2,000 families were forced from flooded homes. Jean-Baptiste later said she received unconfirmed reports that two more people drowned Wednesday while trying to cross a river that overflowed its banks in the southern town of Les Anglais. Cuban authorities suspended classes in the western province of Pinar del Rio and prepared to evacuate tourists from campgrounds and low-lying areas, according to Granma, the Communist daily. More than 1,000 people were evacuated in the island's eastern Granma province. With preservation of lives its first priority, Cuba always evacuates before the advent of hurricanes, with most evacuees going to the homes of relatives or friends and the remainder to government run shelters, reports CBS News' Portia Siegelbaum. Jamaica, where heavy rain has fallen since Sunday, closed almost all schools and 350 people were living in shelters. One man died Sunday in a rain-swollen river. A military helicopter plucked 19 people from rooftops Tuesday in St. Catherine parish, where some areas were flooded with up to 7 feet of water, said Barbara Carby, head of Jamaica's emergency management office. "The problem is that with the level of saturation, it doesn't take much more rain for flooding to occur, so we still have to remain very much on alert," she said. Prime Minister P.J. Patterson ordered the military to make emergency food shipments to stranded residents. In the Cayman Islands, schools and most businesses were closed as heavy rains fell intermittently. About 1,000 residents lost power. The storm was expected to dump up to 25 inches of rain in mountainous areas of Cuba, and up to 15 inches in the Caymans and Jamaica. Up to 12 inches were possible from Honduras to the Yucatan peninsula, the U.S. weather service said. Forecasters said Wilma was stronger than the Labor Day hurricane that hit the Florida Keys in 1935, the most powerful Atlantic hurricane to make landfall on record. But disruptive high-altitude winds in the Gulf of Mexico should weaken Wilma before landfall, said Hugh Cobb, a meteorologist at the hurricane center. Wilma's track could take it near Punta Gorda on Florida's southwestern Gulf Coast and other areas hit by Hurricane Charley, a Category 4 storm, in August 2004. The state has seen seven hurricanes hit or pass close by since then, causing more than $20 billion in damage and killing nearly 150 people. Forecasters said Wilma should avoid the central Gulf coast ravaged by Katrina and Rita. Those storms killed more than 1,200 people. Wilma is the record-tying 12th hurricane of the Atlantic season, the same number reached in 1969. Records have been kept since 1851. On Monday, Wilma became the Atlantic hurricane season's 21st named storm, tying the record set in 1933 and exhausting the list of names for this year. The six-month hurricane season ends Nov. 30. Any new storms would be named with letters from the Greek alphabet, starting with Alpha.